Each year we typically have between 90 and 100 vendors participate in our craft fair. Crafts often include clothing, decorated boxes, jewelry, marionettes, aluminum can art, hand carved wood items, ceramics, hats, flower arrangements, soap, and a wide range of unique handmade gift items. 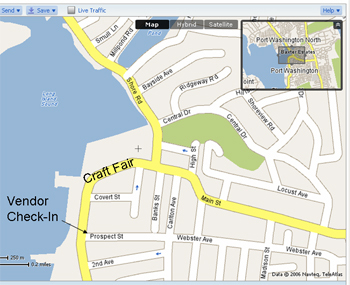 The location of the Craft Fair and Check-In is shown on the map below. Items need to be handmade or hand embellished. We prefer that the artist be present, although this is not an absolute requirement. We do allow multiple vendors in different categories, although this typically is not an issue, except for jewelry. We do limit the number of jewelry vendors to thirty-five.